Banyan Tree Tamouda Bay in Morocco has launched a ‘Summer Delight’ package to entice Middle Eastern couples to indulge in a romantic escape this holiday season. The package enables guests to enjoy a three-night stay in a Bliss Pool Villa with daily breakfast for two people, an upgrade to the next category, dinner in Tingitana for two from a select menu, one rainforest experience in the spa, plus the chance to avail a 15 per cent discount on all Spa treatments – a package valued at $2,879, available until August 31. 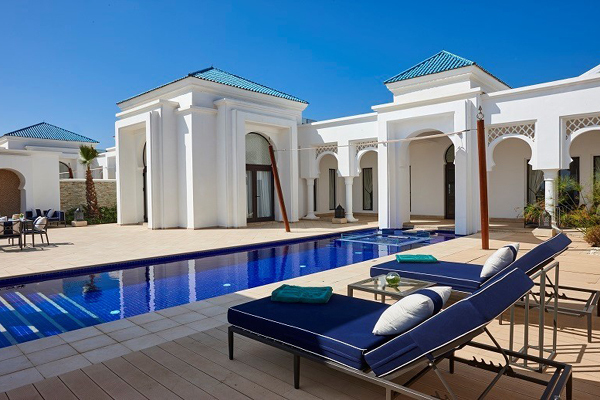 A stunning beach retreat, Banyan Tree Tamouda Bay is located on the northern coast of Morocco, and is an exclusive all-pool villa resort that blends romance with exotic Moroccan charm – imparting complete relaxation with its laid-back vibe. White-sand beaches, sparkling waters and unique local experiences ensure a holiday to remember. It is these factors (and more) that make Banyan Tree Tamouda Bay a sweet escape for newlyweds and couples looking for an intimate, nurturing holiday experience. Hit the road in a luxury car and discover the region: book a two-hour tour and explore the undiscovered region of Tamouda Bay. Alternatively, a leisurely bike ride through the hills and forests around Smir Lake gets guests close to tranquillity, unspoiled terrain and a diverse topography featuring rocky mountains, forests and lakes. Tura Island is a small, uninhabited rocky islet located near the coast of Morocco. Situated just 200m off the mainland coast, the name Isla De Perejil literally means ‘Parsley Island’ when translated from Spanish. Venturing around the island leads to a personal discovery of Mount Moussa, Belyounech Village and a famed cliff that overlooks two continents and two oceans. For both the experienced diver and those wishing to learn the basics, a memorable underwater adventure awaits in the bay of Belyounech. Experienced divers can pair up with a diving buddy to explore at their own pace, or guests can team up with a dive master, who provides peace of mind while the novice admires the vibrant marine life below. Meanwhile, Jet Ski and Nautical Ski sessions are perfect for those with a need for speed. This romantic, curated dining experience is a private and memorable culinary journey for two on the shores of the Mediterranean. Private staff will discreetly serve a refined four-course meal, with Tamouda Bay illuminated by soft candlelight, fire torches, and a blanket of stars. Surrounded by forest, hills and green fields, Lake Smir has become an attractive destination with 22km of off-road track around it, making it ideal for a private and romantic picnic amidst a scenic backdrop. Learn to make gourmet cuisine through a creative and engaging cooking session. Choose between traditional Moroccan or/and Thai cuisine, guided by highly experienced chefs from Banyan Tree. At the end of the workshop, a certificate will be awarded to acknowledge these newly acquired cooking skills. All that activity is thirsty work; luckily, Volubilis bar is the ideal spot to enjoy a classic drink or refreshing signature cocktail.